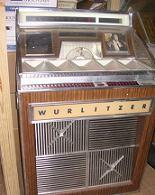 1965 Wurlitzer 2900 Jukebox. The box is unrestored but clean and in good working condition. This box is from the late 60's and would be a wonderful addition to your home or business.